What can you create with 1 ukulele, Sharpie pens and 2 hours? Find out at SPRUKE Art! Brisbane Ukulele Musicians Society Inc is delighted to give you the chance to WIN one of 36 places at the SPRUKE Art activation, to decorate a uke during SPRUKE Brisbane’s Ukulele Festival. Let your creative spirit run free! Winners receive a Mahalo ‘Rainbow Series’ ukulele. We’ll supply the Sharpie pens and give you 2 hours to create your SPRUKE Art. Sessions will be allocated at the discretion of Brisbane Ukulele Musicians Society Inc. Winners will not be given the opportunity to select their session. This competition can only be entered on the Spruke Festival Facebook page. 2. LIKE and COMMENT on the competition post….Simple! Not sure what to comment? Tell us what you’d draw on your ukulele at SPRUKE Art. Winners will be notified by messenger and announced on the SPRUKE Facebook page and on the Competitions page Monday 25 September 2017. Winners must be residents of Queensland, over 13 years old and able to attend their allocated session at SPRUKE Festival to be eligible. The Competition is hosted by Brisbane Ukulele Musicians Society Inc, and is in no way sponsored, endorsed, administered by, or associated with Facebook. Mahalo Ukuleles are supplied by Morris Brothers Music Store. SPRUKE Art is a chance to chill out and be creative in a different way. Find the SPRUKE Art activation at the entrance to the festival on Ernest Street opposite Cordoba Cafe Stage (Espresso Plus). We’ll supply a place to create, the Sharpie pens and some friendly encouragement. The winners of our Facebook competition will receive a ukulele and a guaranteed spot. 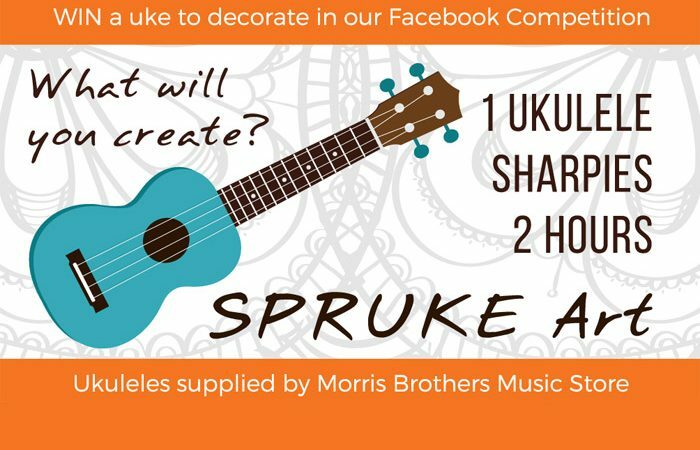 If you don’t win and you’d like to participate, you can buy your Mahalo ‘Rainbow Series’ ukulele from Morris Brothers in the Music Market and join one of the sessions. Your design can be as simple or complex as you like… just as long as you can complete it in 2 hours! The artist is Jenni Onn, Illustrator and Creative Director of our advertising sponsor Creative Traveller Magazine. Jenni created ‘The Moonlight Mermaid Uke’ in just one hour and 4 pens! For those who need a little inspiration Jenni has also created some additional designs exclusively for SPRUKE Art. We’ll take a pic of all our artists with their ukuleles at the SPRUKE Selfie Frame and share on our Instagram feed @SprukeFestival for your ultimate bragging rights #sprukeart #sprukefestival. You don’t have to be able to play but you might want to learn with your unique new designer ukulele. Pop around to the Beginners Ukulele Oasis for a FREE lesson!